Written by Denise Deby. Thanks to Sarah Kirkpatrick-Wahl, Conservation Coordinator at Nature Canada, for the information. In the heart of Ottawa, you’ll find song birds, water birds, frogs, salamanders, snakes, turtles and a huge variety of mosses, lichens and other plants and wildlife–all at Mud Lake. 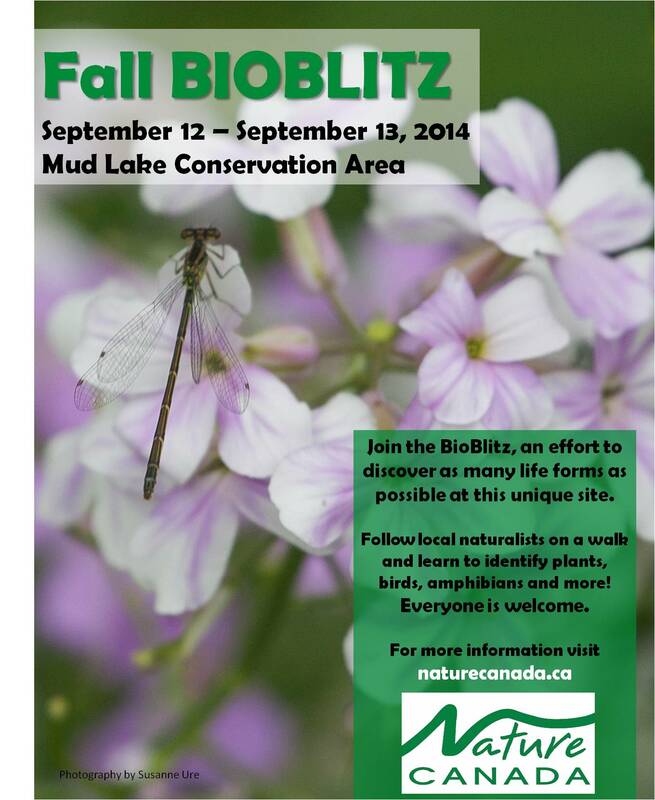 Come out to look for them this weekend at Nature Canada’s 24-hour BioBlitz. From Friday, September 12 3 p.m. until Saturday September 13 3 p.m., local experts will be leading nature walks on the flora and fauna at Mud Lake. For example, Patrick Killeen, lead taxonomist with the Mud Lake Biodiversity Project, will explore trees, shrubs and grasses on Friday afternoon and Saturday noon, while Nature Canada’s Alex MacDonald leads an evening “Critters and Sounds” walk. Bill Halliday and Julie Chateauvert look for reptiles and amphibians on Saturday. By participating, you’ll be helping Nature Canada document the species in the area, and getting to know the treasure that is Mud Lake and the Britannia Conservation Area. Check the Nature Canada website for more information.